Guess what, guess what? I got to work on the house some more! Yes! Those were basically my New Years Day plans, go to the house with mom and dad because we all had the day off. Our main task, electrical. Zap zap. My biggest foray into the wonderful world of the mystical electricians was changing out a lightswitch plate prior to. I was totally qualified for this. 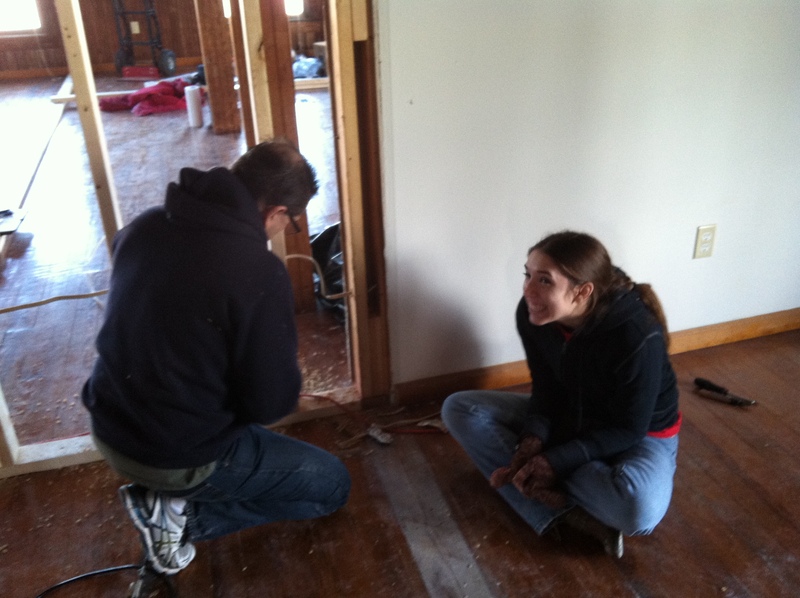 Sitting with Dad in what’ll be my bedroom, supervising the situation. Yeah, I mostly observed and checked to see if dad would get electrocuted if he touched something. But hey, it was something at least. So we spent the day wiring the outlets for my bedroom and cleaning up the wiring hanging from the ceiling. Wait…we need overhead lights, don’t we? Hehe. Probably should figure that out huh? Yeah, probably. Luckily that realization came early in the day so it didn’t cause us any problems. We also got some wiring done on the new kitchen wall, though we didn’t finish. Turns out there’s nine pages missing from Dad’s wiring book and they were kind of the ones we needed. Also, this happened when testing the light in my bedroom. Me: Father, the lightswitch is upside down. He wired it right, but he screwed it on upside down. Least it was an easy fix. Better than when we were testing the outlets in my room and it kind of maybe blew the breaker. It was all well and good except Dad said “Oops” loud enough for Mom to hear and I got reprimanded for not doing a good enough job keeping Dad from electrocuting himself. 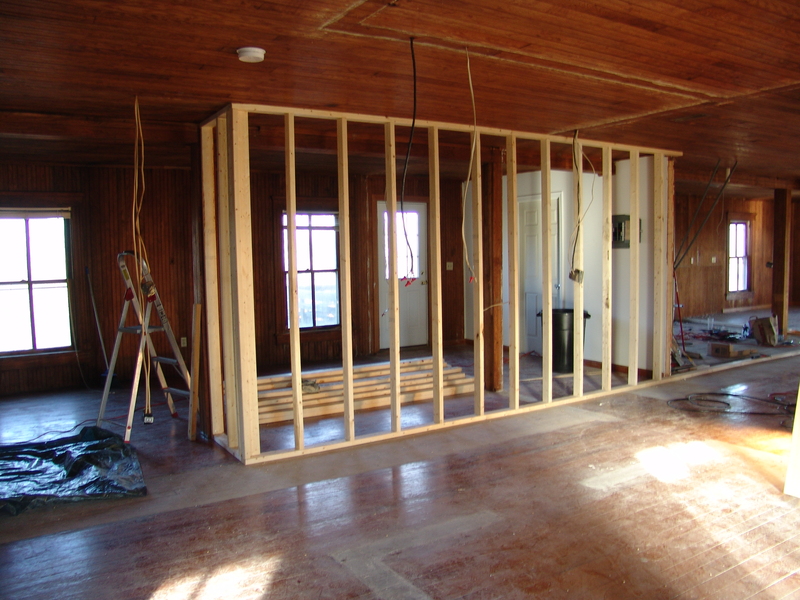 The new kitchen wall that’ll separate it from the living area. So, while Dad was pulling the arms off things (I have no memory of the context for this, but I felt it necessary to write it down apparently) Mom was downstairs leading an assault on the bathroom armed with bleach, vinegar, and a mask. She was down there for hours, we could smell the fumes all the way upstairs. Apparently there had been a cat who took a fancy to the bathroom at some point and left us some lovely smells and vomit in return. Bleh. But, on the bright side, the bathroom doesn’t smell anymore. AND WE HAVE HOT WATER. It was exciting because the past several weeks it wasn’t working and then Mom came upstairs asking us what we did (to which Dad and I both looked at her fearfully because my first thought was there was water spraying out of the sink downstairs or something). So yes, magically the hot water returned to us. Hurrah! 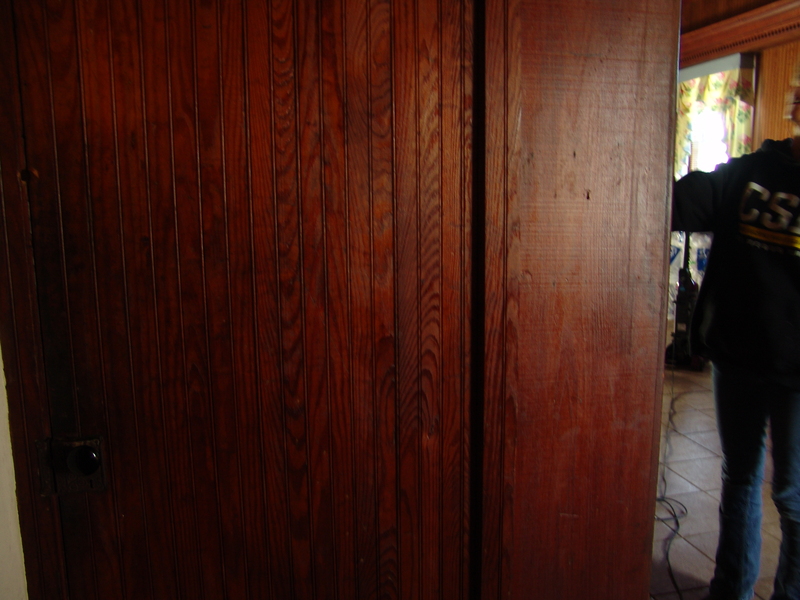 Also, Mom took wood polish to the basement door and well, see for yourself. Basement door after Heidi oiled it. Look at how rich it is! We just stood there staring at it for a little bit, frankly it’s the best looking part of the house right now. Seriously can’t wait to be able to go after the rest of the wood and make it all look that nice. Did I mention someone gave us wood polish for Christmas? Yeah, we’ll need it. It’s Raining Men…No Wait, It’s Just Raining. Inside. From A Pipe.